We’re pleased to announce that we will be exhibiting at Learning Technologies 2018 (Twitter handle #LT18uk) – Europe’s leading showcase of organizational learning and the technology used to support learning at work. 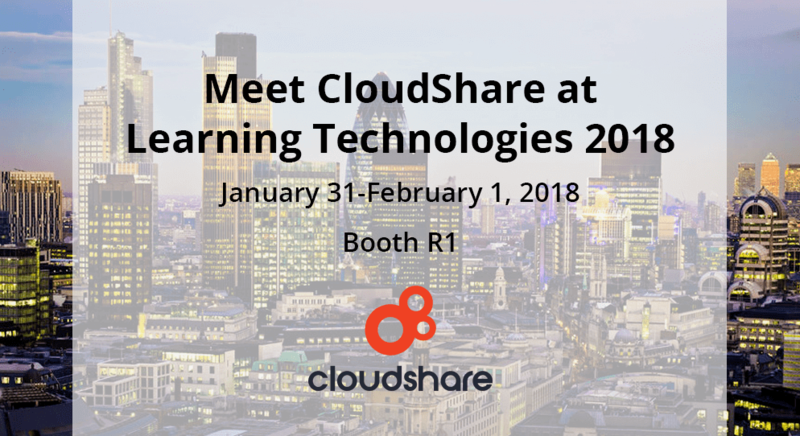 CloudShare virtual lab experts will be on-site at booth R1 for visitors to experience its rich features and ease-of-use firsthand, and to discuss the latest research. CloudShare’s specialized training cloud enables software and IT trainees to learn and practice on realistic environments in a no-risk atmosphere. No longer hampered by the need to operate, maintain or move complex on-premise labs, cloud-based labs enable training departments to expand their global reach and teach more courses, increasing revenue while minimizing overhead. In addition, CloudShare’s ease of use and specialized training features reduce the need for IT support and enable training teams to focus on course development, rather than on technical and administrative issues. If you want to see how easy and comfortable it is to train with CloudShare, or would like to learn about the latest research from actual IT trainees, or just like to have a chat with one of our team, then come and join us. Book a meeting at our booth here or just stop by.